For my money, the three greatest non-traditional books on leadership are Tribes, Patton and His 3rd Army and Sacred Hoops. Tribes is the closest to being a traditional leadership book, because of its core theme. However, when I think of traditional leadership books, I’m referring to books like the over-recommended ‘Good to Great’, ‘Blue Ocean’ and ‘The One Thing You Need to Know.’ Meanwhile, ‘Patton and his 3rd Army’ is such an insider’s view of the decisions leaders are faced with, under duress. ‘Sacred Hoops’ is nothing like any “management” book I’ve ever written. Yes, there are management tools, so to speak, in the book, but it’s more about the soft skills needed to lead. As many of you know, I’ve recently gotten into soccer. In doing so, I picked Manchester City as my team. Last year they brought on Pep Guardiola, widely considered to be one of the best futbol managers ever. He gets results with incredibly distinct and unique methods. 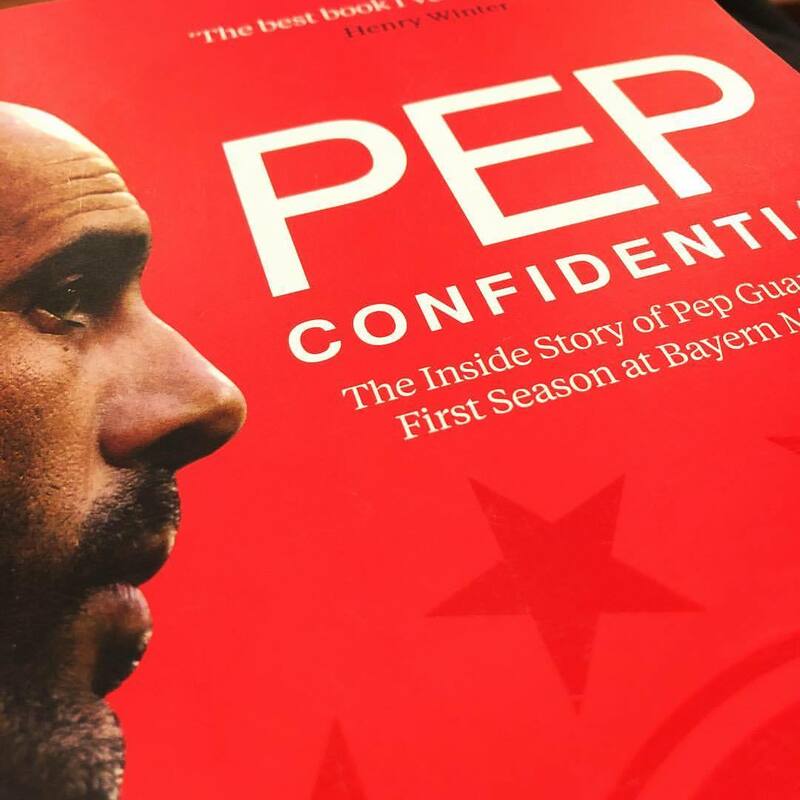 A couple of weeks back I ordered, ‘Pep Confidential: The Inside Story of Pep Guardiolas First Season at Bayern Munich‘, by Martí Perarnau. It’s a good read if you’re a soccer fan or someone focused on continually learning new leadership and management skills. While I don’t think the book is as well written as Sacred Hoops, I will say it’s a heck of a page-turner. The author’s access to Pep, his team, and the players is astonishing. I learned a lot about soccer and leadership. Organizational design / philosophy is not that the same as an org chart. In the context of soccer, a philosophy to dominate possession is not equal to a playing formation like 4-4-2. You can have that philosophy in a number of tactical lineups. If you want an organization to change, you have to change as well. Pep comes to Germany, bringing a new system, staff, and ideas. What does he do? He learns German and provides instructions in German. He also works on his English, which he knows is also widely understood in Germany. Everyone deserves the chance to buy in, but if someone doesn’t buy in, you have to get rid of them or take them out of the equation. That someone can be a star player. When Zlatan wasn’t playing as instructed, Pep benched him. To make the system work, no star can shine brighter. Ignore positions and labels. Players are told and accept that they are a fullback, midfielder, striker, winger, etc. This is limiting. Instead, you must look at competency. Does someone have the ability to play multiple positions? It’s quite possible they can. As a Manchester City fan, I’m seeing that happen every day. He’s taking midfielders and making the fullbacks. He’s taking strikers and having them play as wingers. He’s brilliant in this approach. It never hurts to get the band back together. Part of the reason managers bring in people they’ve managed and worked with, in the past, is not blind favoritism. No, it’s because not only do they not need to learn the system, they can also help others learn the system. There are a number of people I’ve hired and rehired for that same reason. It really does make a major difference. There’s probably a lot more I could have added, but I think these were the ones that spoke to me the most. I suspect they spoke to me the most because they validated a lot of my own thinking. Of the 5, the emphasis on organizational design and philosophy is the one that I believe is the most important. If you bring a philosophy and mindset to an organization instead of a preconceived notion about how to well, organize the organization, you’ll be better off. Org charts, if anything holds us back. Once you eliminate the concept of management through org chart, you can then start to apply #4. And if you can combine #1, #4 and #5, you’re usually going to be doing something amazing. There’s a follow up to the book called ‘Pep Guardiola: The Evolution‘, as you might have suspected, it’s next up on my reading list.